The Gel Venture 5 is the latest installment of the popular series of trail running shoes from ASICS. Available for both men and women, this running shoe is loaded with features that make it a great fit for just about every kind of runner. It comes with GEL cushioning technology for maximum impact absorption, and its tough outsole provides ample and long-lasting grip for just about every kind of terrain. To top things off, it comes in all kinds of colors, meaning runners can pick the color they think best fits their style. The ASICS Gel Venture 5 Men’s Trail Running Shoe comes with a multitude of features that make it a great option for those who are into trail running. While you can conceivably use it in different terrains and road running, this runner seems best suited for trail running because of its design. From the upper’s construction to the outsole’s configuration, this shoe is designed with trail running in mind. The Gel cushioning provides great impact protection, and the sock liner is removable to accommodate medical orthotics. The shoe fits true to size, and there are multiple sizes to choose from. The shoe is also available in multiple colors, some of them being specific to the men’s version. Ensuring maximum comfort is a combination of ASICS’s Gel technology and a molded ethylene vinyl acetate midsole. Molded ethylene is both lightweight and responsive, while providing additional cushioning at the underside of the foot. The Gel is equipped in the rear section of the shoe. This setup absorbs impact from heel striking and provides much-needed cushioning. This setup makes it a great shoe for those who run with their heels striking first. The upper is made using breathable mesh, with synthetic materials added in strategic portions such as the toe cap and the overlays. All these features, combined with a fit that goes true to size, promise maximum comfort. Built for trail running, ASICS has constructed the Gel Venture 5 to be tough enough to withstand trail running. The mesh, while providing maximum ventilation where you need it, is woven in such a way that it won’t give out or get torn easily. Synthetic overlays are installed in strategic locations to provide added stability and toughness for the upper. The midsole and outsole are thick, giving it great shock absorbing properties and wear resistance. For additional wear resistance, tough AHAR outsole rubber is used in high-wear areas. It is easy to envision the shoe to be durable enough to be used for marathons and events of that kind. While the ASICS Men’s Gel Venture 5 Trail Running Shoe carries the vibe of a purpose-built trail runner, it never skimps on style. It has a very functional yet super smooth design that looks nice both up close and from afar. This shoe also comes in all kinds of colors, meaning you can grab a pair that best fits your personality and/or outfit. Some of the color combinations are plain, while others feature bright and loud colors. Fortunately, most color combinations in their lineup don’t seem like complete dirt magnets. With a mostly smooth design and a multitude of colors to choose from, the Gel Venture 5 is reasonably attractive without being too obnoxious. 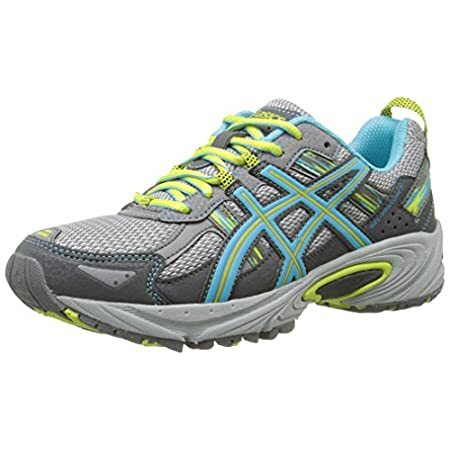 The ASICS Gel Venture 5 has scored well in most customer reviews (more on this later) for good reason. This is because this shoe brings all kinds of advantages to the table. The first thing that works in its favor is its durability. The materials used are great, and the build quality is topnotch. The outsole provides great grip in most conditions, and the rubber used should last for a long time. The shoe is remarkably nice to wear: the fit is nice, ventilation and support are both awesome, and shock absorption is ample, especially for heel strikers. There are only a few cons associated with the shoe from our testing. While generally speaking, this shoe fits true to size, some may find it to be too narrow. Just to be sure, make sure to fit your pair before buying. There are also some concerns about the sole, as it doesn’t seem to hold up as well as it is advertised for some buyers. The reviews from men who used the ASICS Gel Venture 5 for themselves have been mostly positive. In fact, most of the reviews give it a 5-star rating. What customers love most about this pair is the comfort: they find the shoe so comfortable to wear while running. Also, many users love their versatility. These shoes are used anywhere from jogging to competitive running, and they still performed excellently. Perhaps the only concern coming from customer reviews is subpar durability from some pairs. Some experienced sole detachments and tearing at the stitched sections. The ASICS Gel Venture 5 Trail Running Shoe is mainly designed for trail running purposes. Its rugged construction and comfort-oriented features give maximum performance and durability for running in trails, roads, and other rough terrain. Built for trails, it can still be used effectively for all kinds of outdoor running activities. The ASICS Men’s Gel Venture 5 Trail Running Shoe is very popular for good reason. It is a trail running shoe that is more than just that: it is a versatile runner that can be used by both serious and not-so-serious runners alike.